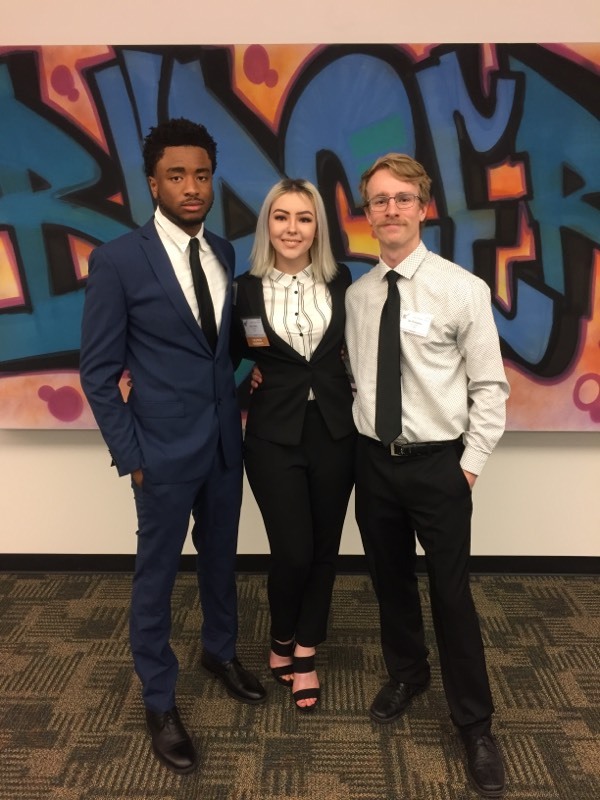 Three students from USU Eastern’s FBLA-PBL program won 10 awards at the state leadership conference/state business competition held at Snow College recently. Eastern competed against Snow, University of Utah, Utah Valley University and Southern Utah University. Chloe Wilson, Springville, partnered with Ian Thompson, Tooele, to take second place in management analysis and decision making; second in business presentation and fourth in organizational behavior and leadership. Thompson placed third in management concepts and contemporary sports issues. Robin Bopeso, Ivry-Sur-Seine, France, placed fourth in entrepreneurial concepts and sports management and marketing. He also placed fifth in the job interview category. The State PBL Competition was a great opportunity for our Business Club to get involved, network with other students, and learn more about business and related fields. We can›t wait to compete again next year and hopefully bring a bigger group to represent Eastern,” Wilson said. “USU Eastern students at the PBL conference were great competitors and represented Eastern well. I am proud of everything they accomplished,” PBL adviser, Henning Olsen, said.